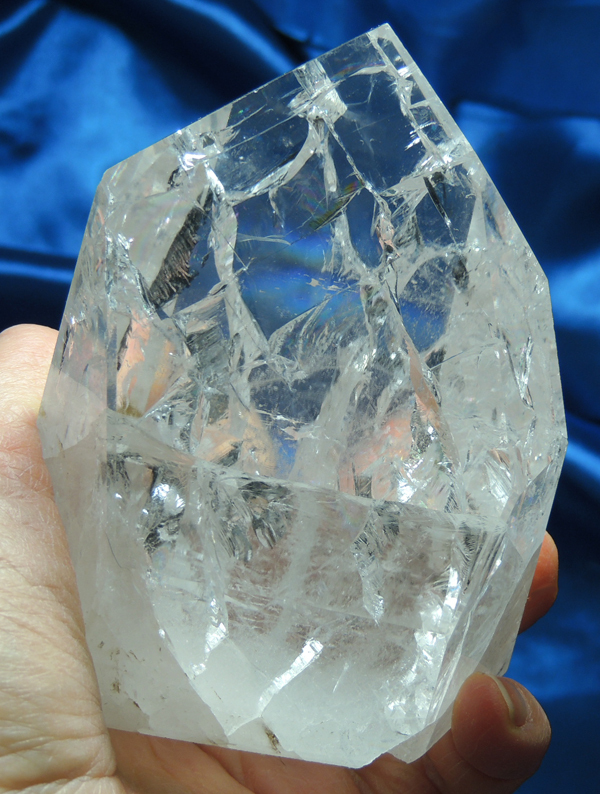 This is a wonderful polished quartz crystal with channeler termination that is very clear than with inner foils that kind of criss-cross each other … kind of checkered. He is 1 lb 1.8 oz, 3.5” by 2.7” by 2.2” from Brazil. The foils have a benefit though … delightful rainbows appear as you turn him in the light and believe me, he is alive with them! His base shows just a bit of golden healer and light misting … and a little notch (visible in the pictures). He is truly a joyful Spirit with many gorgeous smiles for his Keeper! He can be used for scrying (and he is WONDERFUL at that!) or with crystal grids as an activating crystal. He gently encourages the energy to flow, allowing you important contact. You can change the energies within the grid simply by rotating the dominant face in the direction you want to receive. He is as delightfully energetic as he is handsome!